Last year (2014) was a year of hiking plans gone awry. For whatever reasons, I was unable to follow my dream of hiking and backpacking around the UK for a year and this disappointment left me feeling a little deflated to say the least. It wasn’t just the fact that I had to abandon my #packlife adventure, but also that I had talked about doing it across my social networks and felt a failure too. All things considered the whole episode left me rather depressed if truth be known. So it came at on opportune moment when I discovered that my friend and hiking companion Stuart Greig had also been interested in an article I was reading by adventurer, author and motivational speaker Alastair Humphreys posted at the back end of 2014. The article talks about how to set small goals and achieve them through planning and executing #microadventures each month for a year. 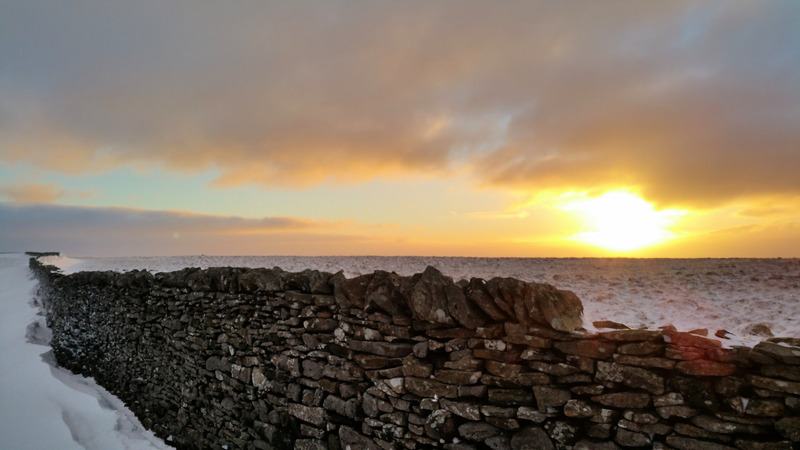 What resonated with me (and Stuart) – was the line “Each month the challenge is to spend one night out in the wild” , which isn’t surprising since we both enjoy wild camping. So Stuart and I set about making plans for our own MicroAdventures and this blog post is the first of 12 that I hope to write during the year sharing these microadventures with you as we undertake them. 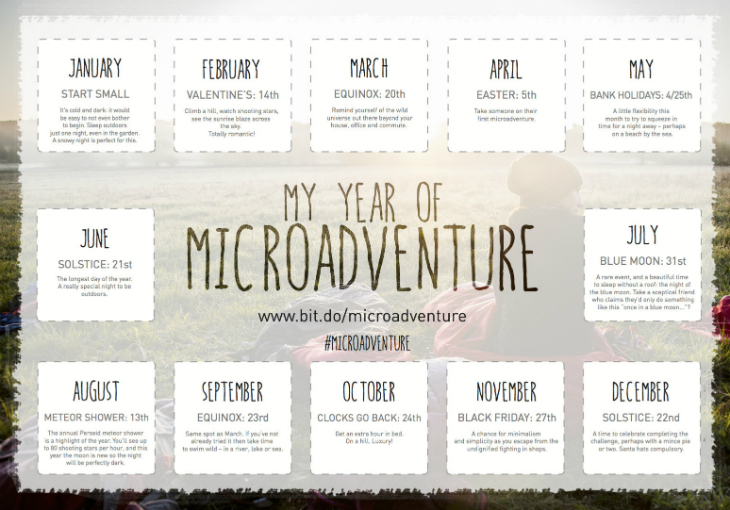 You can find out more about Alastair’s ideas for #microadventures on his site – A Year of MicroAdventure and maybe find inspiration for your own micro adventures this year. So, onto our first #MicroAdventure of the year. 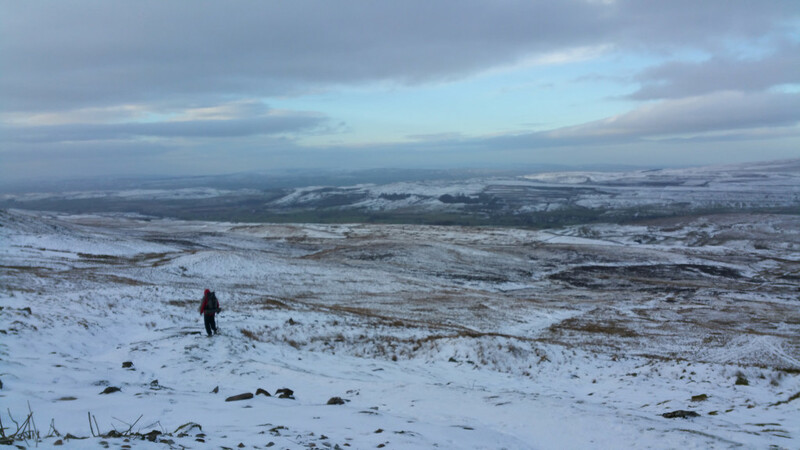 Our original plan of hiking in the Shropshire hills was abandoned due to uncertain wild camp locations and time scale – we only had the last weekend of January free and the weather conditions were not favourable in that part of the country for that time period. 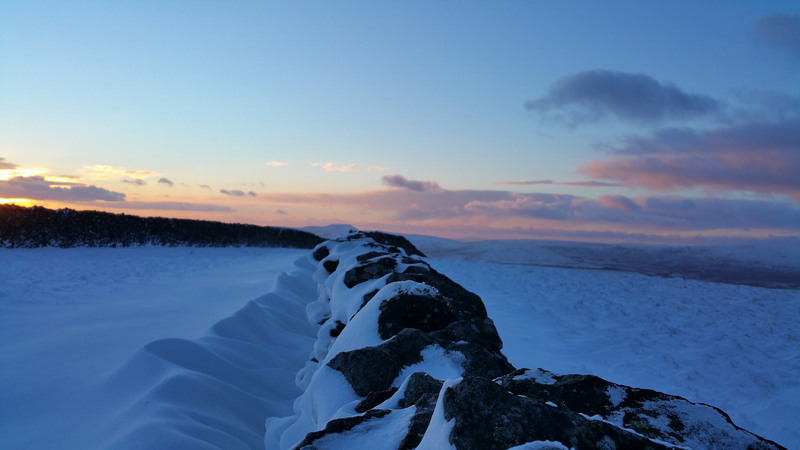 Instead we settled on more familiar territory – Yorkshire – and whilst the weather forecast was still not ideal (high winds, very low temperatures and plenty of snow and ice warnings) the area we chose was well known to both of us and Plover Hill promised criss-crossing walls to, hopefully, shelter our wild camp from the worst of any winds. This proved to be wishful thinking as it turned out, but more on that later. We decided to start hiking from Horton-in-Ribblesdale, a small village and civil parish in the Craven district of North Yorkshire, famous amongst the walking and hiking community for its convenience for those attempting the Yorkshire Three Peaks Challenge and, securing the car, we headed off at lunchtime onto the Pennine Way path towards Pen-y-Ghent. The weather was good, with wonderful blue skies and a crisp air although the pretty white clouds scampering overhead indicated that it may be much windier as we gained altitude. 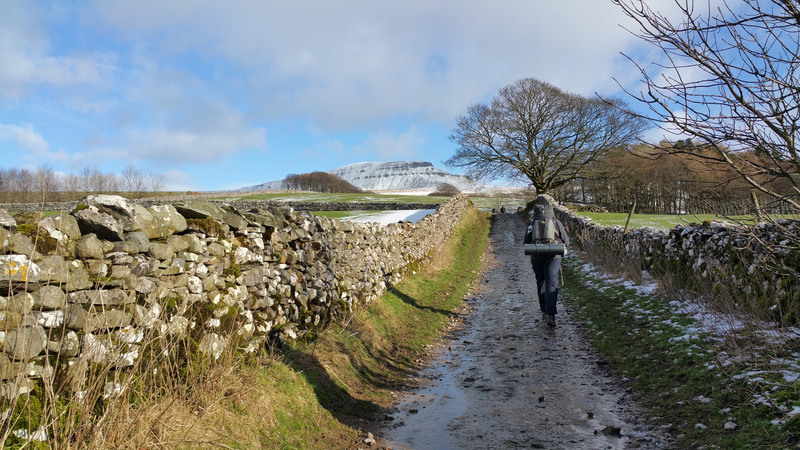 There were a few folk out enjoying the day, mainly coming down off Pen-y-Ghent, and there were a few bemused looks when they saw the size of our backpacks – understandable really as they were all carrying daypacks. When we told a couple of walkers we planned on camping up on top they were encouraging, but their looks implied we must be mad! 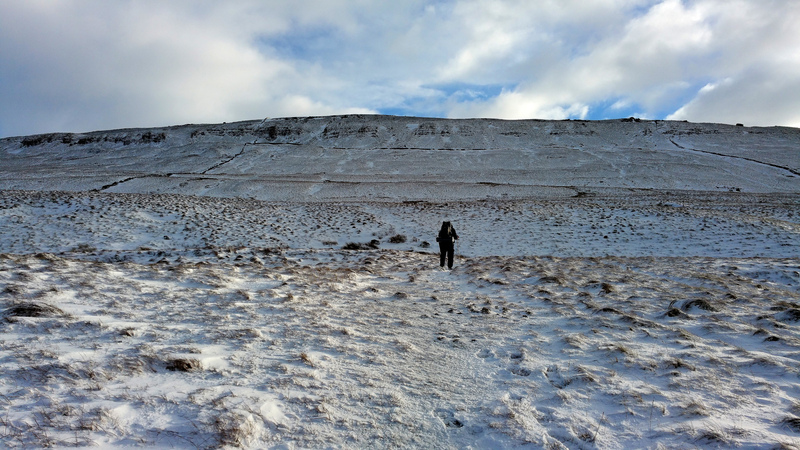 We decided not to head up the nose of Pen-y- Ghent – I don’t like that ascent at the best of times (I am not built for scrambling!) 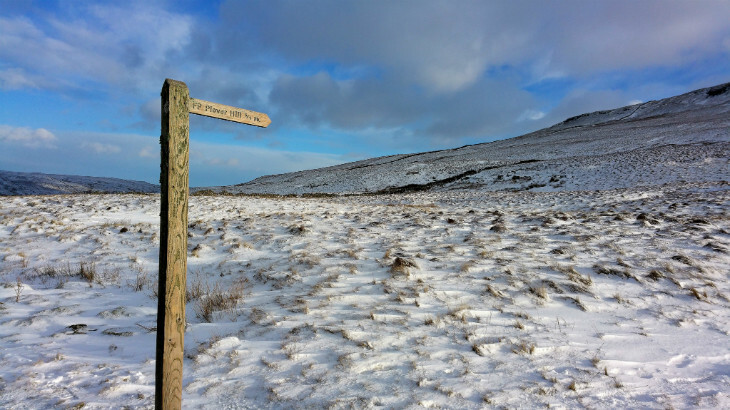 and with snow and ice underfoot it seemed an unnecessary risk carrying our heavy packs too – so we followed a path around the foot of the hill on the eastern edge of Horton Moor towards Foxup Moor where a fingerpost sign points the way up Plover Hill via a steep climb. 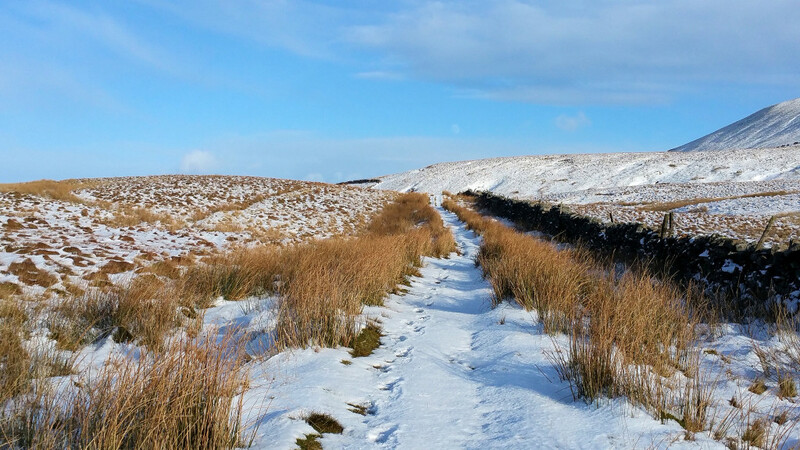 The snow was crisp underfoot and we followed the single set of footprints left behind by an earlier walker (earlier that day or the day before we couldn’t tell) until we came to the sign pointing up Plover Hill. 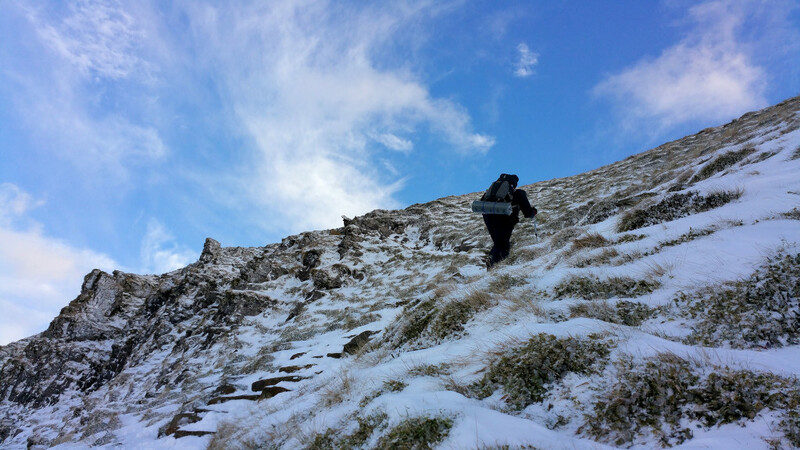 The ascent up the west side of Plover Hill is steep and, with 2-3 inch snow underfoot, wasn’t so easy as to take for granted, but crampons, spikes or ice axes weren’t required although the wind was certainly picking up and made the last section of the climb interesting! The photo doesn’t show it, but the wind was gusting at 35-40 miles an hours as we neared the summit. At the summit I took a wind speed reading of 42 miles an hour (!) using my new mobile phone weather station, the Skywatch Windoo 3 and I certainly felt it! With the snow underfoot resembling a frozen lake due to being repeatedly melted, blasted by the wind and re-frozen and with the high winds pushing us along it was like involuntary skating on the most bumpy ice rink you can imagine. I wished then I had bought my spikes along! Soon however the footing stabilised, and we headed to a section of the hill that was criss-crossed by stone walls to set up camp for the night. We had high hopes of finding a sheltered spot from the wind as there were many walls running in all directions, but the reality proved very different. With the snow banked high on each side of all the walls – about 5 in all – and the wind seemingly coming from all directions we simply couldn’t find even relative shelter let alone an oasis of calm to pitch in. We settled for what was effectively a cul-de-sac, with 2 walls either side of us and a third ahead of us pitching the rear of our tents to the only area that wasn’t sheltered from the wind. However, this proved to be, in effect, a wind tunnel and as we couldn’t get our tents close to any of the walls due to the deep banks of snow against them this ‘wind tunnel’ meant that the wind bounced off all the walls and came at us from all angles! Joy!! Now my tent (the blue one) has a very low profile, pitches very taught and handles wind very well indeed and doesn’t suffer from ‘flappage’ like a lot of other solo tents do, but that night even my bomb-proof shelter was tested severely by the circulating wind in our cul-de-sac of a pitch! Poor Stuart suffered considerably from flappage and the noise that night was, shall we say, disturbing! Whilst the evening was clear, the sudden drop in temperature combined with the gusting winds soon had us scurrying inside our respective tents and shouting to each other over the noise until we gave up trying to communicate and simply settled in with our own miseries. Though that isn’t strictly true. Whilst it certainly wasn’t the best nights sleep I’ve ever had, it was exhilarating. Before sleep (or, more accurately, fitful rest) overcome me, I made my evening meal and hot drink and settled to watch a movie on my large screen mobile phone. It’s so handy during the long winter nights outdoors to be able to watch movies and TV programs or to read books downloaded to my phone and I discovered that Stuart had downloaded a film I had downloaded too – American Sniper. So we synchronised start times and watched the movie ‘together’ in our respective tents which gave a sense of companionship whilst the winds howled and the tents shook around us. During the night the air temperature in the porch of my tent read -8C, but I was warm inside my down sleeping bag – especially as I had purchased a cheap foam sleeping mat from GoOutddoors the previous day to go underneath my Multimat Superlite Sleeping Mat. I had discovered on a previous snow camp that the Mutimat offers absolutely no insulation properties and, whilst it may rise 2 inches from the floor and is extremely comfortable, it does allow the cold to seep up into your body! Blog post on that methinks. Sunrise on a cold morning! After a fitful night I awoke to my water pack being frozen solid – something I had never experienced before! I have a CamelBak hydration system that I wrap in my spare clothes to keep from freezing, but it was so cold during the night that it froze anyway. So no morning brew for me! Funnily enough Stuarts water hadn’t froze, but we had packed our gear way for the hike back to the car before Stuart knew I hadn’t had a drink otherwise he would have gave me some of his water. I will remember to speak up sooner next time! 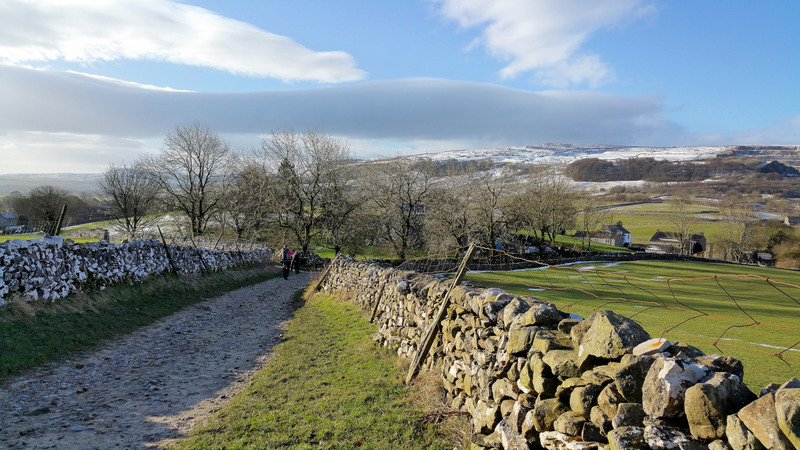 It had been our first MicroAdventure of 2015 and we had both enjoyed it immensely and were already looking towards our second one! Remember you too can start your own #microadventures for the year – it’s never too late to set yourself a goal for the month and to enjoy achieving it! Back to Horton at the end of our first #microadventure. Accompanied Adventures, My Adventures backpacking, Hiking, microadventure, Pen-y-Ghent, Pennine Way, Plover Hill, Water, Yorkshire. permalink. Best Foot Forward – Foot Care Tips for the Long Distance Hiker. James and I once camped next to Hull Pot Beck, not far up from Hull Pot itself, which was a nice spot. I’ll have to try yours out sometime! 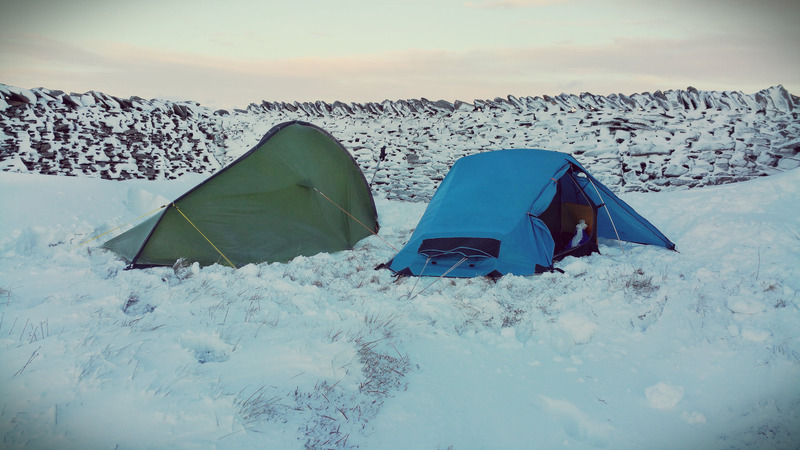 Usually have fun when hiking and wild camping regardless of conditions – just love being out. Just writing up February’s #microadventure which was fun too. The scene of my first ever adventure! Really Alastair? That is wonderful! When was that?